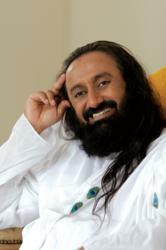 "All of us must realize we are one world family – and that we belong to one humanity as we celebrate the diversity of different cultures and traditions,” said Sri Sri Ravi Shankar, Founder of the Art of Living Foundation. The Art of Living Foundation (AOLF),an educational and humanitarian non-profit announced today that it has completed 30 years of education and service bringing happiness, peace and development to individuals and communities in the United States and the world as a whole. The Foundation, which offers stress management and self development programs, in partnership with International Association for Human Values (IAHV) has worked on several initiatives related to health, education, sustainable development, conflict resolution, disaster and trauma relief, prisoner rehabilitation and women empowerment to positively impact millions of people in more than 150 countries over the last three decades. Founded in 1981 by global humanitarian and peace ambassador, Sri Sri Ravi Shankar, the Foundation offers programs that are specially designed by him to improve emotional and physical well being. Sri Sri has rekindled the traditions of yoga and meditation and offered them in a form that is relevant to the 21st century. Unique breathing practices, effortless meditation and ancient wisdom allow individuals to deal with stress and angst of the modern world in a practical and effective manner. Sri Sri has been engaged in promoting human values, fostering interfaith harmony, building communal unity, encouraging social responsibility and spearheading humanitarian causes around the world. The Foundation celebrated its 30th anniversary in a unique celebration of harmony in diversity when it organized a peace festival, World Culture Festival, in Berlin, July 2-3. This festival brought thousands of participants from 151 countries to spread the message of global peace, intercultural dialog and togetherness. In the United States, the Foundation offers a wide variety of programs for all ages. Meditation is a common theme across all these programs. Sudarshan Kriya®, a powerful breathing technique that incorporates specific natural rhythms of the breath that harmonize the body, mind and emotions is taught to the participants who are able to discover inner reservoirs of energy and peace in their daily life. Several research studies point towards the benefits of this technique. Expanding its footprint in the U.S, the Foundation, in collaboration with IAHV and Ved Vignan Mahavidyapeeth (VVM) will soon offer self-development workshops for adults, corporate retreats, leadership development for young adults, summer camps for children, specialized programs for returning veterans and international cultural events through the new facility called International Center for Peace and Well-Being in Boone, NC. More than 50 high schools have benefited from Youth Empowerment Seminar (YES! ), a program of IAHV. This compelling program offers the youth practical tools and life skills to manage stress and addresses a critical issue of education today. As students learn to reduce stress and manage emotions they gain the ability to focus and perform well academically at school, as well as the ability to build more positive relationships with their peers, parents and teachers. The Art of Living Foundation provided material aid and trauma relief to more than 2,000 people after Hurricane Katrina, and its Youth Leadership Training Programs continue to make a difference in New Orleans. In New York City, the Foundation offered free trauma-relief programs to thousands after 9/11. The trauma-relief programs are also being offered to US Iraq war veterans and their families. Founded in 1981, the Art of Living Foundation is nonprofit 501(c)(3) educational and humanitarian organization working in special consultative status with the United Nations Social and Economic Council. One of the world’s largest volunteer-based organizations, the Foundation is present in more than 150 countries and works to create a violence-free, stress-free world by strengthening the individual.